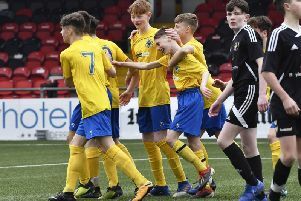 Institute boss Kevin Deery feels Saturday’s win over Lurgan Celtic could be a big one at the end of the season. Although only nine games into the league campaign, Deery believes late winning goals play a big part in many successful seasons. “It’s those sorts of victories that can really define your season,” he insisted. He was also delighted at Michael McCrudden kept his 100 per cent record intact from the penalty spot, as he fired home their equaliser in the closing minutes. “It was great character from Michael in particular to step up and score the penalty,” added the Stute boss. Meanwhile former Stute striker Ryan Campbell has been named Championship Player of the Month for September by the Northern Ireland Football Writers’ Association. The Dergview front man has been in fine form for the Castlederg side in recent weeks, he scored five goals in the month. “It’s a great honour for me to win this award and I would like to thank the Football Writers’ for selecting me” he said. “However, I think the result reflects how well we have us done as a team, so I have to pay tribute to my teammates. “We had a disappointing result against Ballyclare last weekend, but I’m confident we can continue to challenge in the top half of this division. “Our aim at this stage is to be in the top six, come the split, and then take things from there.